A little bit of disclaimer before I start: no, I do not have a picture of myself wearing this makeup in this post. Why, you ask me? Your home girl is super lazy to put her makeup on without having anywhere to go. I love makeup, but I certainly would not wear them for fun. My idea of fun is chilling at home with shorts and t shirt on, hair up in a bun, my eyeglasses and pale face on. Yes. I have been watching PONY Makeup religiously on YouTube for the past few weeks. If you didn’t know her, she’s a famous MUA in South Korea and also a MUA for 2NE1’s CL. She is so great at makeup! 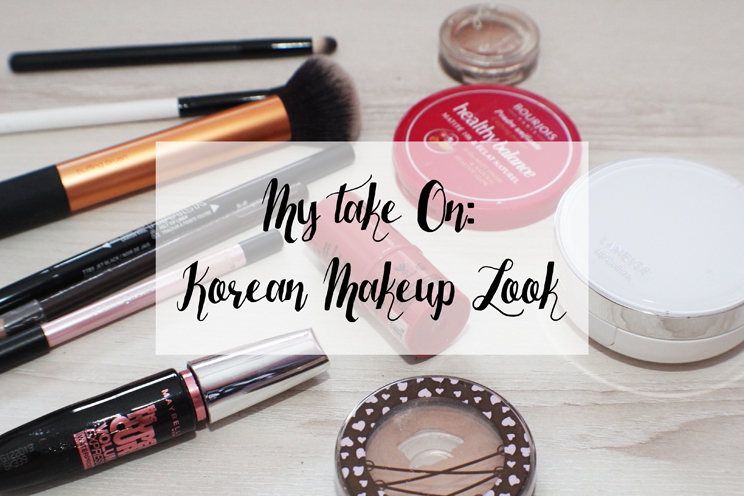 I really like Korean makeup because the look enhances our features while western makeup is all about pasting 3 shades darker of foundation on the face with fake lashes and a heck lot of contouring. No hate for western makeup, though, I love them too but sometimes it can be too overpowering for just a simple day-to-day look. You can, however, tone it down, but I’m talking about those makeup looks you always see beauty gurus making tutorials of. Yes, that. I am an avid user of Laneige BB Cushion. 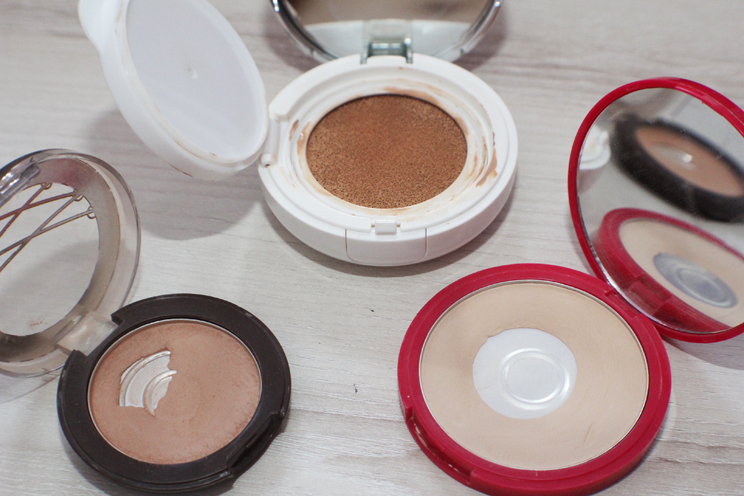 There are a lot of cushion compacts in the market right now but I’ve never been inclined to buy other than Laneige. I am very comfortable with the product, it doesn’t break me out at all. The coverage is sheer to medium so you definitely have to use concealer to cover your blemishes. I do not wear concealer because I want people to be able to see that I don’t have a flawless skin and when my skin does get clear up, I want to be able to compare the condition of my skin before and after I lose all the acne scars. If you have dry to normal skin, it’s okay to not set your liquid base but if you have combination/oily skin, it is a must to set it to prevent more oil. 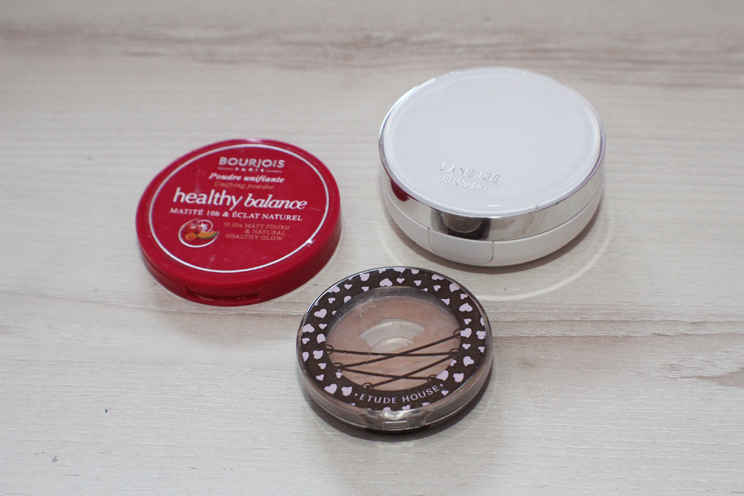 The powder I’m using is Bourjois Healthy Balance powder in Vanille. I would focus on the area under my eyes (trust me they will crease), forehead, nose, and chin. That’s where I get oil the most. Watching PONY Makeup, she loves to lightly contour her nose and eye crease. For that, I’m using Etude House Face Color Corset in number 4. The shade is not too dark which is suitable for my fair skin. You can totally skip this step if you want to. For eyelashes, I’m using the Maybelline HyperCurl Mascara. Maybelline has a wide range of mascaras you can choose from but my absolute favourite is the one in yellow tube. I forgot its name but it made my lashes looked awesome. The other mascara I love is NYX Baby Doll if I’m not mistaken the name and that one is even better. I have super long lashes but unfortunately they are not curly. Even eyelash curler couldn’t help to keep them curled. 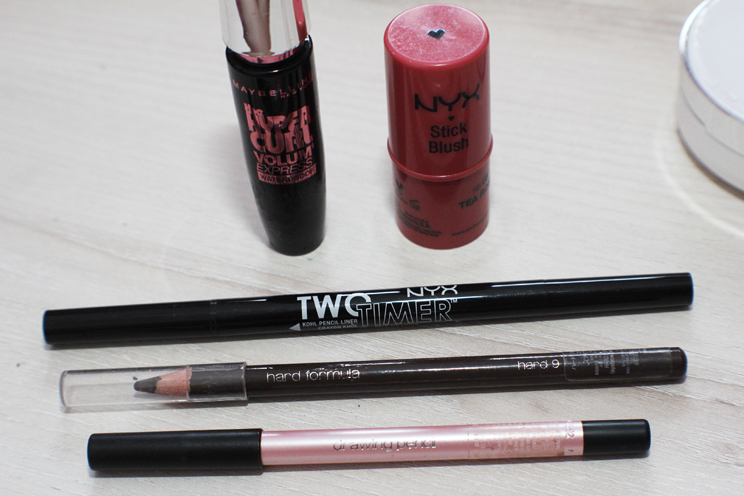 Eyeliner: NYX Two Timer Dual Ended Liner. I love the felt tip side for a sharp wing liner. The other one I’m using for tightlining and brightening the inner corner of my eyes is the Shu Uemura Drawing Pencil in ME Pink 04. It has metallic finish so it’s perfect for that shimmery look. Eyebrow: Shu Uemura Hard Formula in hard 9. The pencil interacts with the oil in the brow hair to release the colour pigment so you won’t get a swatch on your hand. The Koreans love that natural and undefined brow look so this pencil is perfect for it. Cheeks and lips: NYX Stick Blush in tea rose. I love this blush so much! It is very long lasting and the shade makes it look like you’re actually blushing. I would also use this product on my lips. The Koreans love lip tint or any sort of lip products that leave colour stain so this stick blush is perfect. You want to look like your lips are naturally pink. For the lids, I’m using Etude House Look At My Eyes eyeshadow in sand gold. The shade looks really brown in the picture but the actual shade is gold. It’s shimmery, of course. I love shimmers. I would put this all over my lids, creating a wing. I’d also put some on my bottom lashes. It looks amazing. 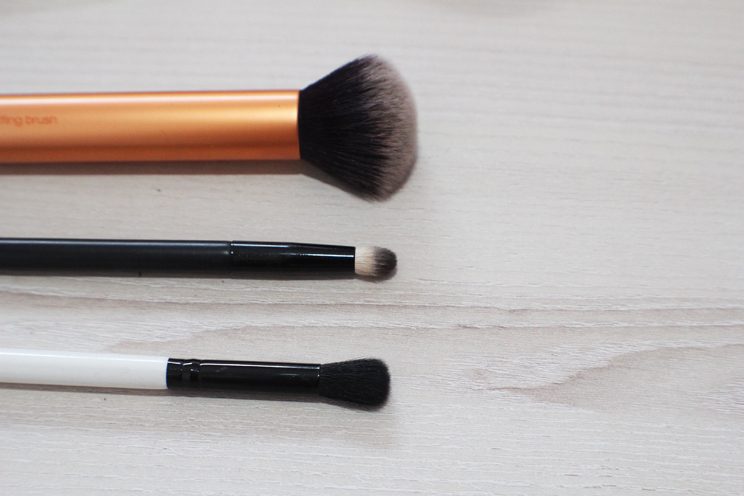 These are the only brushes I’m using for this look. For BB Cushion and powder, I’m using Real Techniques Buffing Brush. I also recommend using a beauty blender or any kind of sponge you have since beauty blender is hella expensive 80 ringgit for a sponge, mm no thank you not now. For eyeshadow, I’m using Etude House blending brush. The bristles are actually white but the other day I did a smokey eyes on my sister and I still haven’t washed it (along with the other brushes in the picture oops). The brush picks up the product really well. For shading, I’m using Too Cool For School mini blending brush. 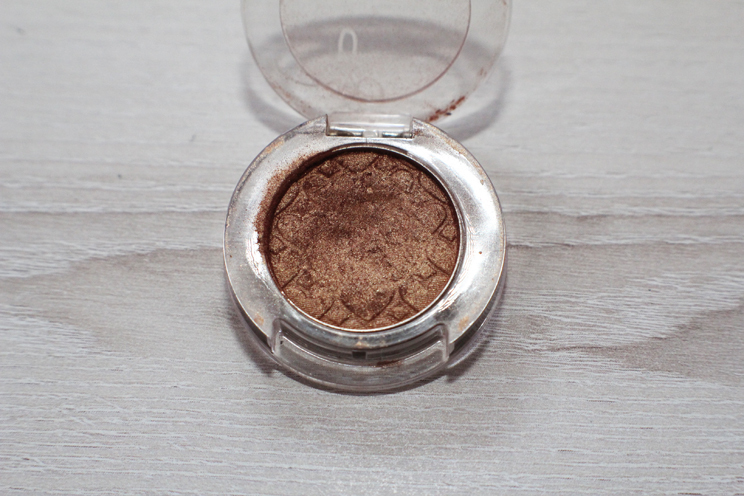 It’s awesome for shading and for your crease colour. After your makeup is done, don’t forget to set it with a setting spray! 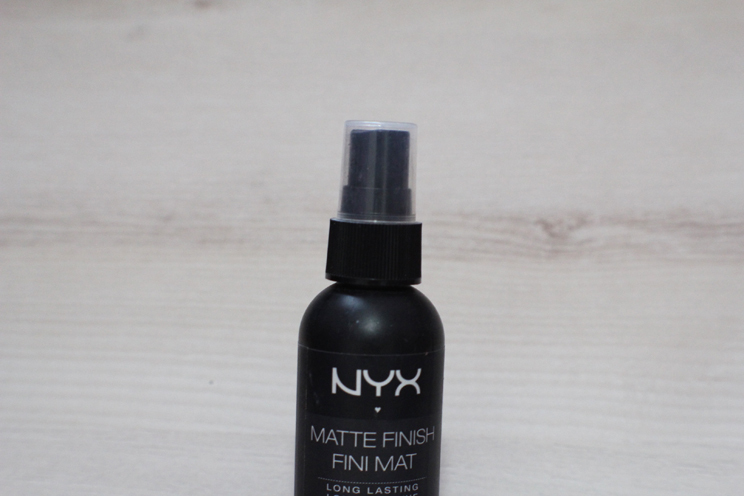 For oily skin, I would prefer going with the Matte Finish just to mattify all of the products on your skin.